The distressed faces of Ms Mova and Ms Tagalong said it all. They grimaced and gawped as the lovely Isa Brown, so vibrant a few hours ago fell headlong into its porridge. Eyes closed, she was limp in the hands of Ms Tagalong. It might do to back up a little and say that as they were working in the garden on Saturday, they noticed one of the girls, who should have been happily tearing up one of the allocated beds, squatting down and seemingly heaving, tail down. ‘Might be eggbound, ‘ said Ms Mova authoritatively. Then added, ‘Shall I look it up?’ and went off to consult the Great God Google. Ms Tagalong was glad the last option was off the agenda. ‘Let’s try the steaming water,’she said. And so it was. Ten minutes after the steaming started, a few gentle pooping sounds later, the definitely off colour hen emitted a strangled sound and collapsed into some carefully mixed porridge oats and olive oil. ‘Well, there’s another one gone then. I wonder what it was for her to go down so quickly?’ Ms Tagalong said. As Ms Tagalong gently lay her hands to the ground the lifeless chicken moved her head. She did, she really did. She opened her eyes and started pecking the oats in the container. Ms Tagalong and Ms Mova watched agape as she then took in water from the small stainless steel bowl next to her. She regained strength and in a few minutes was standing up! But no, she was back. Ten minutes later she waddled back into the run and as she sat down Ms Mova thought the small pen might be better equipped to deal with an egg the size of which no-one in Tighes Hill had ever seen. Don’t know if she ever laid the giant egg but she is happily pecking around today with the best of them. ‘Is this normal chook behaviour?’ pondered Ms Mova. 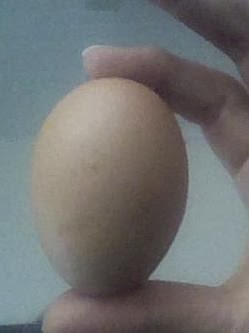 Is this the offending egg?